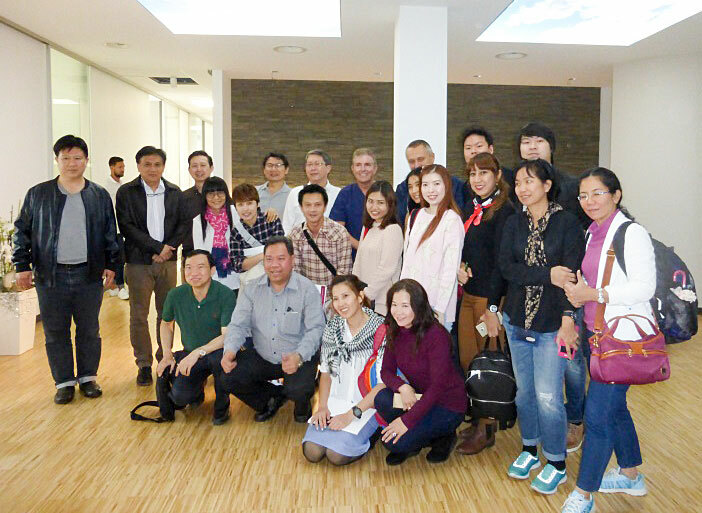 Together with a group of 30 Thai colleagues, Dr Thaweesak Suthatheerarat, President of the Private Dentist Association Thailand (PDAT), came to Viernheim/Germany at the end of September 2016 to complete the final module of the PDAT/DGOI’s Curriculum Implantology. The schedule involved demanding issues such as “The predictable aesthetic outcome in cases with compromised bone and soft tissue situations” and “Contemporary hard- and soft tissue management in the aesthetic zone” as well as the prosthetic management with customized CAD/CAM technology on the basis of clinical cases. Dental techniques, for instance bone splitting, bone block grafting, GBR techniques and connective tissue grafts versus vestibuloplasty, were practised in the course of two live operations. On the following day, the group visited the company buildings of Dentsply Sirona in Bensheim/Germany where they had a look at the production sites and at the Dentsply Sirona Academy. Dr Bergmann is responsible for the successful cooperation with the PDAT. A basic training programme in implant dentistry for Thai dentists and students of dentistry according to the concept of the Curriculum Implantology „8+1“ of the DGOI was developed in collaboration. The Thai-German Congress that will be held for the fourth time in Thailand in 2018 is another common project of the two professional associations. At the end of September 2016, 30 Thai dentists completed the PDAT/DGOI‘s Curriculum Implantology in Germany under the guidance of Dr Fred Bergmann, President of the DGOI.